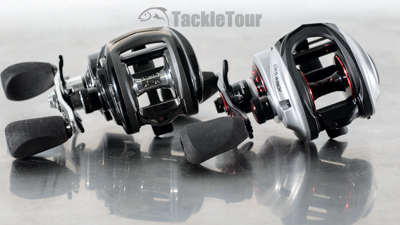 Introduction: Fresh off their Editor's Choice Award win with the Revo X, Abu Garcia is right back in the fire with perhaps my favorite Revo model or at least the one in my lineup that has seen the most consistent use over the years. Granted, I don't get to fish many of the reels I like or collect because there are always new models to test and write about, but when it comes time to review a crankbait or cranking stick, I'll almost always pull out my trusty Revo Winch to help with those tests. 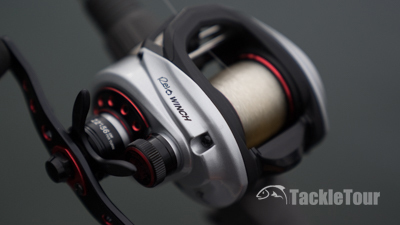 As a result, I was pretty anxious to see what the new, Gen 4 Revo Winch would bring to the table. Let's take a look. 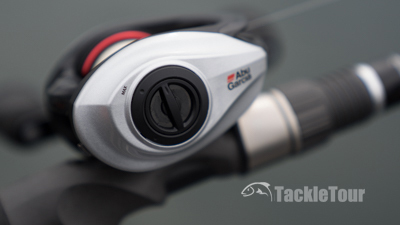 Introducing Abu Garcia's Fourth Generation Revo Winch. 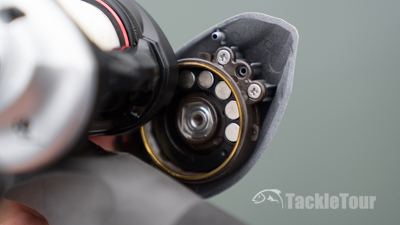 Impressions: Abu Garcia's popular cranking reel, the Revo Winch, is the latest to make a visit to our lab for a little quality time and testing. The Gen 4 model is a contrast to the low key look of the Gen 3. Instead of a stealthy black and silver color scheme, the new Winch has a similar look to the former STX with a black frame and silver sideplates. 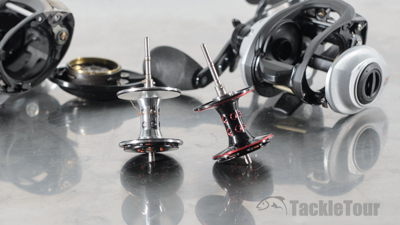 There are also SX like red highlights in the spool, handle, tension knob logo, and the dragstar baseplate. The Gen 4 model is a contrast to the low key look of the Gen 3. Compared side by side, the Gen 4 Winch appears slimmer than the previous generation too, but this is an illusion achieved by a reshaping of the front plate and frame. The respective spools for each reel are the same width and capacity. Having said that, the new generation Revo Winch is actually heavier than the previous gen (7.5oz vs 6.9oz). Compared side by side, the Gen 4 Winch is slimmer than the previous generation, but this is an illusion achieved by a reshaping of the front plate and frame. Real World Tests: We take a closer look at the refinements in the new Revo Winch a bit later, but first things first - I wanted to fish this new reel. To accomplish these tests, I spooled the Gen 4 Winch with some new Sunline Cranking Fluorocarbon and paired it with an ARK Rods cranking stick. The respective spools for each reel are the same width and capacity. The Winch's braking system is not an area of refinement. Casting: The Winch's braking system is not an area of refinement from the previous generation reel to this one. Like the previous generation reel, the new REVO Winch makes use of a dual brake system featuring centrifugal brakes on the spool, and magnetic brakes tucked inside the the non-handle sideplate. 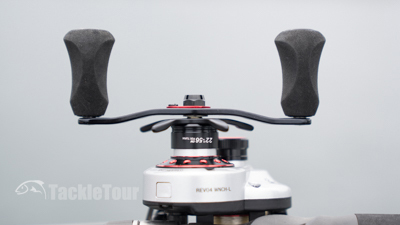 There are six points of centrifugal brake adjustment on the spool, and the magnetic brakes can be adjusted via a dial on the non-handle sideplate. Like the previous generation reel, the new REVO Winch makes use of a dual brake system featuring centrifugal brakes on the spool, and magnetic brakes tucked inside the the non-handle sideplate. 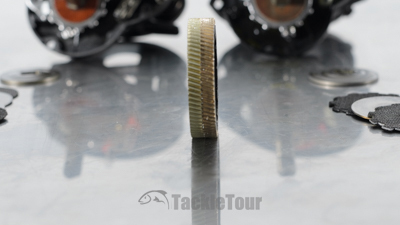 The Winch will comfortably cast baits from roughly three eighths of an ounce (3/8 oz) on up to whatever size you choose. I personally tested it with everything from Berkley's Dredger Crank to paddletail swimbaits to glide baits with this reel all with no issue whatsoever. The 95mm stock handle is another carryover from Gen 3. Retrieve & Power: One area there is a marked improvement with the new Winch is in retrieve. 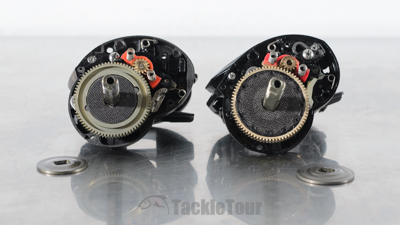 Abu Garcia has upgraded the main gear in this reel to brass and you can feel it in both the smoothness of retrieve and power. 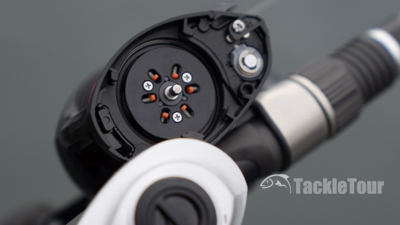 Additionally, the stock, ninety five millimeter (95mm) handle gives you plenty of leverage to dig into the reel's low gear ratio. 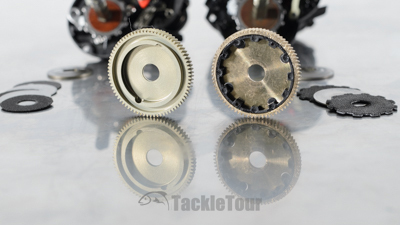 Abu Garcia has upgraded the main gear in this reel to brass (right side). You can feel the change in both the smoothness of retrieve and power. The Winch's aluminum frame and sideplate also play a role in giving you solid, powerful, smooth performance with a noticeably direct feel from handle knobs to the reel's gearing. The drag stacks are different too (Gen 3 left, Gen 4 right).